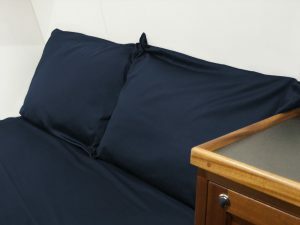 Complete sheet sets will save you some money, but if you’d like the freedom to mix and match we also offer our boat sheets as separates. Each sheet set consists of a fitted bottom sheet with elastic completely around the base (except for reverse corners where we put gussets). You will also get a fitted top sheet (extra fabric is eliminated for shaped beds such as V-Births), plus two standard pillow cases.